This issue's article is from Steven Vogel, a mechanical engineer from the US. The method shown in this article has an application in calculating compound interest that will be shown in the next newsletter. "n choose k" not only gives you the individual coefficients, it also answers the question "how many different groups of k items can I make from a pool of n items." When the exponent of (a+b)^n is small, it's relatively easy to determine the coefficients by either Pascal's Triangle or the formula above. When the exponent n is large, however, the n! terms become very large and unwieldy. Can you imagine drawing out Pascal's Triangle for (a+b)^52 to determine how many groups of 5 cards can be drawn from a deck of 52 cards, or taking the factorial of 52 without a calculator? At the end of chapter 32 of his book Vedic Mathematics, Bharati Krsna tells us that the binomial theorem is important, that it has many uses, and that it has a Vedic form which is more comprehensive than the current one. We will never know for sure what his method was, but I'm sure it would have been cleaner and easier than taking the factorials of large numbers. Certainly if there were a way we should be able to think about it and remember it using the sutras. You can see how the multiplier decreases by one each time, while the divisor increases by one each time. By taking the previous term and multiplying and dividing, it is possible to arrive at each term in order. So is it possible to use this to solve the problem of the playing cards? Can you really determine the 5th term of the expansion of (a+b)^52 this way? All of these multiplications are easy using the "vertically and crosswise" sutra, and because the divisions are by smaller numbers it makes things easier. Certainly there is a time savings over calculating the factorial of 52. I hope you are able to apply this technique to solve problems of your own. It is my belief that if we look at Bharati Krsna's Vedic Mathematics closely enough, there are still things left to learn and explore. 3. Question and answer period. It could not have gone better! I whet their appetites for VM with the discussion phase. During the PowerPoint presentation, many of the attendees present were writing down everything on each slide presented. When I demonstrated the number squaring technique, that was the clincher. When it came time for q & a, I was a little anxious that there might not be any questions. The questions started to come fast and furious. In fact, when I ended the presentation (as the next presenter was already there setting up and I didn't want to intrude on him), I had about a dozen individuals rush the lectern wanting more information. These individuals and several others followed me to the back of the room and into the lobby to getting more information on VM. There were several math teachers there who were very interested in bring these methods into their teaching syllabus. My wife, who was sitting at a table in the back of the room became deluged with people wanting more information. I printed up 75 copies of a 1 page description of VM and how to contact me. I felt that 75 copies would be more than enough. It turned out that it was not nearly enough as many people wanted the sheet, but, there were no more available. One woman asked my wife if she could make copies of the page and send it out to the members of her homeschooling group as she knew they would be interested. Needless to say, my wife was thrilled at the request. I had a stack of my business cards on the table and they were all taken. Finally, I told the crowd if they wanted me to contact them directly with more information, they could write their names, e-mail addresses and/or phone numbers and I would contact them. I had 40 individuals sign the sheets for more information. Every one of them left e-mails and home phone numbers. All in all, it was a great day for me and for Vedic Math. This index is for the book "Vedic Mathematics" by Sri Bharati Krsna Tirthaji (1884-1960), and may be of special interest to those using the book for research. 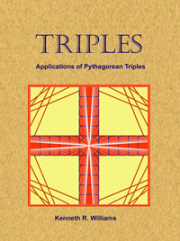 It is compiled by Steven Vogel from the 1992 Edition (2009 printing). Please note though, different editions may have different page numberings. Try 3002 x 204. What we have here are two factors, which are multiples of different bases. It doesn't get more general than this. 3002 + 02 Write both factors as "left justified"
With a little practice, this method will enable you to apply the Base Multiplication method to many more multiplication problems. = 30000 (700 + 16 ) + 15 x 700 + 15 x 16 .
or more generally ( a + a*)(b +b*) = a (b + b*) + a*b + a*b* . The German magazine P.M. printed a 5 page article on Vedic Mathematics in their June 2011 edition. The magazine has a print run of 320,000 copies and is distributed in Germany, Austria and Switzerland.